Seven days a week, BBC London 94.9 gives you the best news, interviews and live action covering a multitude of sports. Every weekday night from 7pm and every weekend from 2pm, we're the home of London sport whichever team you support. We broadcast live on FM, DAB and online everything from the premier league to cricket and speedway. 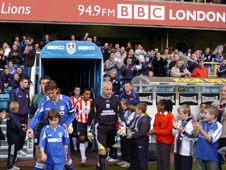 Home and away BBC London 94.9 is your voice for sport. Buncey is one of our regular sports show presenters as one of the BBC's boxing experts. He has appeared regularly on Inside Sport as well as presenting and hosting numerous boxing shows for BBC television and radio along with other broadcasters. He has also covered over 20 different world championships in 12 different countries and has been at five Olympic games: Atlanta 1996, Nagano 1998, Salt Lake City 2002, Athens 2004 and Turino 2006. David is BBC radio's voice of Formula One, providing commentary on every race through the season, and is also a darts commentator. When not following the world's most glamorous sport (F1 not darts!!) he's an avid West Ham and Stevenage Borough fan. Phil is one of the BBC's most accomplished commentators and regularly hosts shows on BBC London 94.9 as well as travelling the country bringing you all the best live action from around the grounds. Emma became a journalist when she realised she wasn't clever enough to be a doctor, or stupid enough to risk a life as an actress. Started as a news journalist, but found that she was always being asked to do pieces that were sport related like Glenn Hoddle leaving the England job, so finally admitted defeat and became a sports reporter full time. She regularly presents on BBC London 94.9 as well as reporting on some of the capital's biggest games. Nick is another of our commentators and presenters at the BBC and can regularly be heard on Radio 5 Live as well as BBC London 94.9. He started his broadcasting career reporting on travel news but followed his heart for a career in sport. He's an Ipswich Town fan but that doesn't stop him being one of THE voices of London sport.